Business Ethics 101 - What Is It & Why Does It Matter? Business Ethics 101 – What Is It & Why Does It Matter? Business ethics might sound like an oxymoron, but it should be a cornerstone of every industry. Jennifer Bridges, PMP, explains what it is and why it matters to managers, their projects and the organizations they serve. 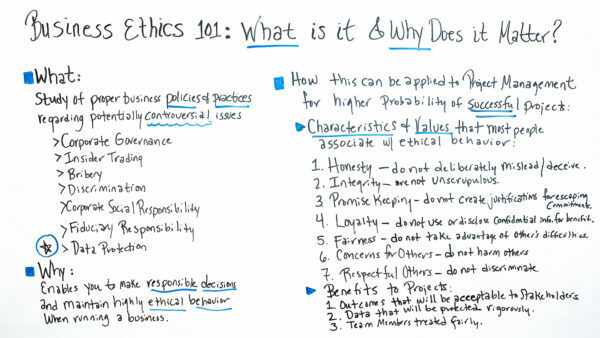 In Review – Business Ethics 101 – What Is It & Why Does it Matter? Ethics are always important, whether you’re a business or not. But as our world changes and becomes more mobile, we’re becoming more tightly governed by our ethical (or not-so-ethical) behaviors, Jennifer noted. Business ethics is the study of proper business policies and practices regarding potentially controversial issues. Some of these crisis points include corporate governance, insider trading, bribery, discrimination, corporate social responsibility, fiduciary responsibility and data protection. The reason why business ethics is important can be seen everyday on the news when some corporation is held accountable for questionable behavior and their brand is tarnished. Business ethics enables you to make responsible decisions and maintain highly ethical behavior when running a business. But how does this apply to project management or management of any kind? Well, if leaders follow an ethical business approach to what they do, there is a higher probability of having a successful project. Honesty: It’s the best policy for a reason, therefore, do not deliberately mislead or deceive. Integrity: Like in a building, if something is not done properly it will fall apart, so avoid unscrupulous behavior. Promise Keeping: If you say you’ll do something, do it—don’t create justifications for escaping your commitments. Loyalty: Do not use or disclose confidential information for your benefit. Fairness: Never take advantage of another’s difficulties. Concern for Others: Do no harm to others. Respect Others: Do not discriminate. It helps to make sure outcomes will be acceptable to stakeholders. Pro-Tip: Business ethics are also beneficial to projects because they encourage and support a strong work ethic for teams. The two types of behaviors align almost exactly, so if you’re promoting business ethics you’re also helping your team work better. Take it Further: It’s important to treat your clients with respect in order to keep their business. Learn more about client management and how to win and retain them. Today we’re talking about Business Ethics 101. We wanna talk about what is it and why does it matter. Well, no matter what industry we work in today, we’re governed more tightly by business ethics. Especially with our social media and mobile lifestyles, the way we work and the way we transact is different than it has been in our past. So what is it? So it’s the study of the proper business, policies, and practices regarding potential, controversial issues. Well, what are some of those? Well, we talk about corporate governance, insider trading, bribery, discrimination, corporate social responsibility, fiduciary responsibilities, and again, data protection, which again is highly talked about around social media and mobile lifestyles. Well, why is this so important? Because it enables you to make responsible decisions and maintain highly ethical behavior when running a business. I would submit too, when running projects. So, let’s look at how this can be applied to project management for higher probability of successful projects. Well, when we talk about business ethics, we also wanna look at the characteristics and values that most people associate with behavior. So that includes not only project managers, but team leaders, team members, stakeholders, and even the executive team and the boards. So when we talk about this, here are just a few, this isn’t all of them, but these are the common ones we see. Number one, honesty. That the members of the team in the project display honesty and they do not deliberately mislead or deceive about what they’re doing. Also, integrity. Keeping high integrity in the work products and the work that they do, the contracts that they make and they’re not unscrupulous about how they go about their work. Promise-keeping and trustworthiness. They do not create justifications for escaping or missing commitments. Also, loyalty. Being very loyal to the project, the organization, the industry, and the initiatives. And they do not use or disclose confidential information for benefit. Also, fairness. They don’t take advantage of others’ difficulties and use that against them. Also, having concerns for others, and they do not harm others, again, in their disabilities or their deficiencies, respectful to others and they don’t discriminate. So, by using these characteristics and values in business ethics, we’re looking at the benefits to the project. So, I submit there are three main ones. Number one is having outcomes that will be acceptable for the stakeholders. Also, data that will be protected rigorously and also team members that are treated fairly. So these are just some of the benefits of business ethics and why it’s so important. If you need additional information on business ethics and how it can apply to your projects, then sign up for our software now at ProjectManager.com.